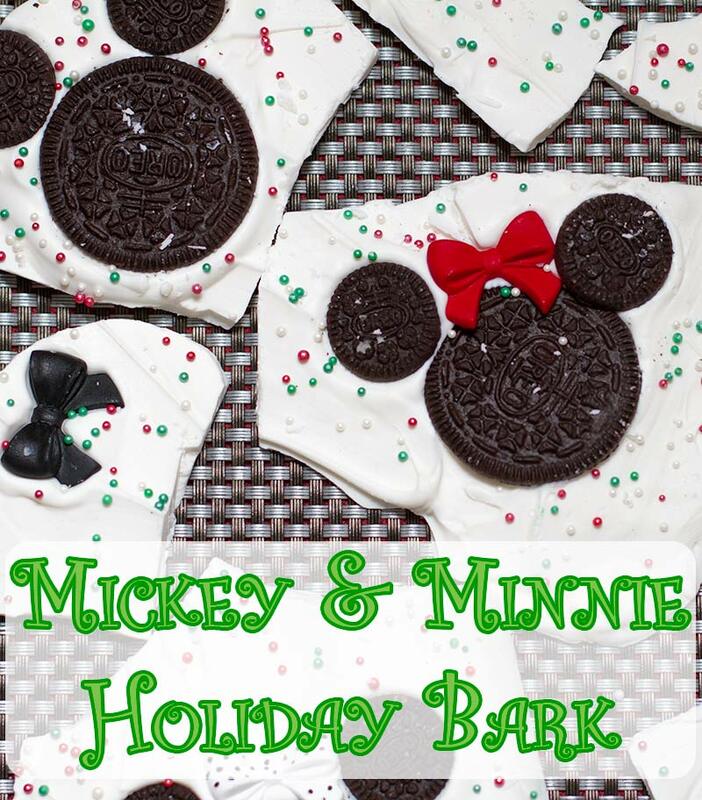 I have to admit one of my favorite things about the holiday season is the amazing smells! Seriously, you can’t walk anywhere without experiencing some type of holiday aroma! My favorite is sugar cookie anything and everything. I love sugar cookie diffuser blends, body lotions, hand soaps, sugar scrubs, and whatever else I can find! Therefore, I couldn’t help but share my little DIY Sugar Cookie Scrub. Step 1: Pour both sugars into the mixing bowl. Step 2: Mix the coconut oil into the sugars. I used a fork to mix it well with the sugars. Feel free to mix in more coconut oil if you want a wetter scrub or less if you prefer a dryer scrub. Step 3: Mix in the vanilla and almond extract. Mix the scrub well! Step 4: Using the spoon, scoop the Sugar Cookie Scrub into the mason jars. Step 5: Complete the Sugar Cookie Scrub with placing the lid on and then decorating the top with ribbon or twine of your choice. 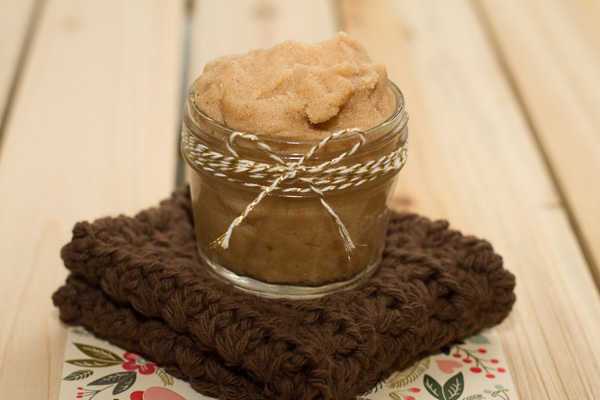 This scrub has no preservatives in it, so it will keep between one to two months. It will keep longer if kept in an airtight container. This makes the perfect gift for family and friends. 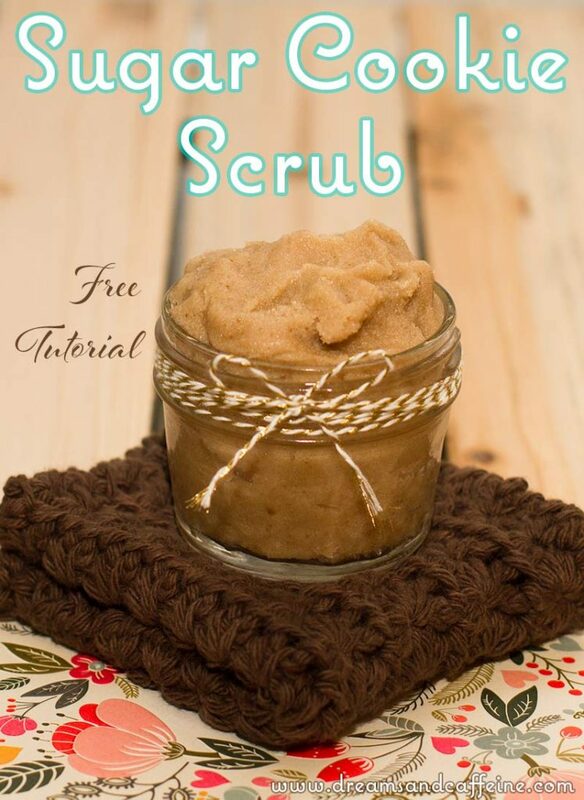 I hope this sugar cookie scrub tutorial comes in handy this holiday season. Please leave a comment and let me know what you think! This post contains affiliate links that, when clicked on and purchased, help support my family. Thank you very much! Welcome back and I hope everyone had a safe and fun 4th of July weekend! I am hoping your Thursday is off to a great start, because mine definitely is. 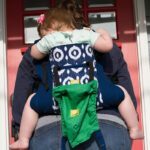 The sunshine is out, the kiddos woke up after mommy enjoyed a cup of coffee by herself, and I am finally sharing my review on TODDLER CARRIERS! I purchased all three of these carriers with my own money because I was in need of a carrier for my toddler. This review is 100% my opinion and none of these carriers were given to me or loaned to me for review. Since, I had done the research, I thought I would share with everyone just in case anyone else was in or going to be in my current situation. However, this site does contain affiliate links, which help support my family, but in no way shape my opinion. Before my little Moose was born, I was adamant that we did not need a second stroller. I absolutely loved my Bob stroller and did not want to replace it with something larger (the Bob is already big enough) nor did I want to spend the moolah on a double stroller. My goal was to wear my son, which would allow our daughter to still use the stroller as needed, but she didn’t regularly ride in it willingly. Great plan… unless your adorable little boy came out with absolutely no intention of allowing you to wear him! Keep in mind, I have many baby carriers and to my total dismay, he has no interest in any of them despite the variety of ways you can wear him. He is just not a snuggler (I may be crying a little as I type this sentence). Unlike his sister, who would still love for me to wear her, he doesn’t like to be cozied up. Instead, he likes to be laid out with lots of space to wiggle and move. 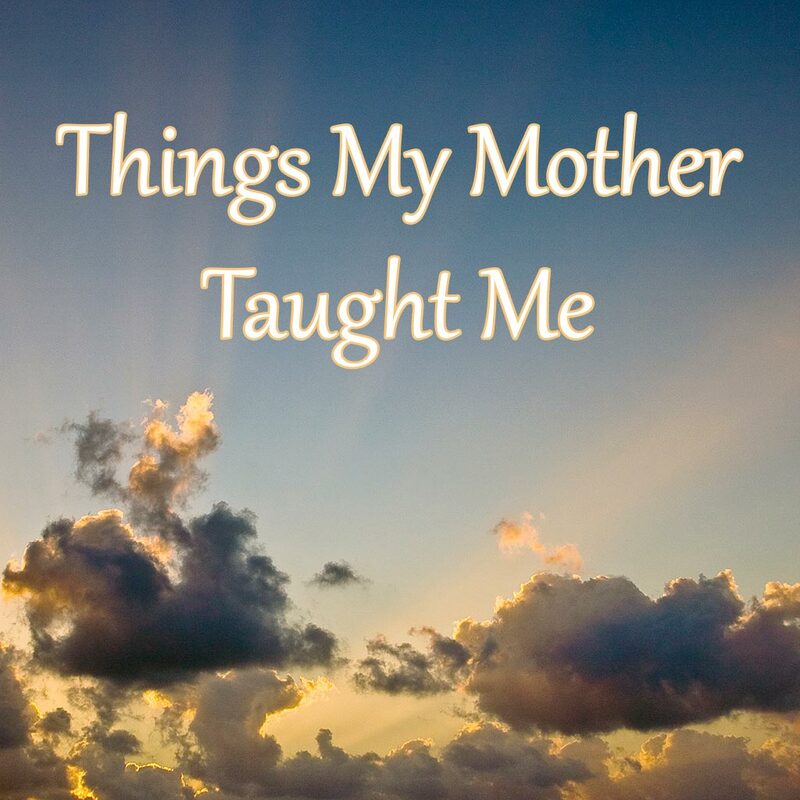 So what is a mother to do? To the Internet I went – researching other options that would fix my current situation. At that point I realized there are carriers made specifically for toddlers. SHUT THE FRONT DOOR, right?! 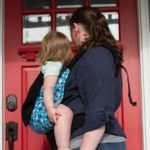 Let’s go over the basics that should be considered before selecting your toddler carrier before we delve into the details of each one. Toddler wearing is a personal choice and finding a comfortable carrier that suits your and your child’s needs varies. 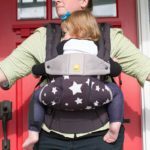 Things to consider before purchasing your carrier are: your size, age, where/how you prefer to wear your child, what kind of straps and padding does the carrier provide, if it provides lumbar support, where and how long will you be wearing the child, what kind of weather will you be in, and lastly, the size of the child. I am a plus sized short female. 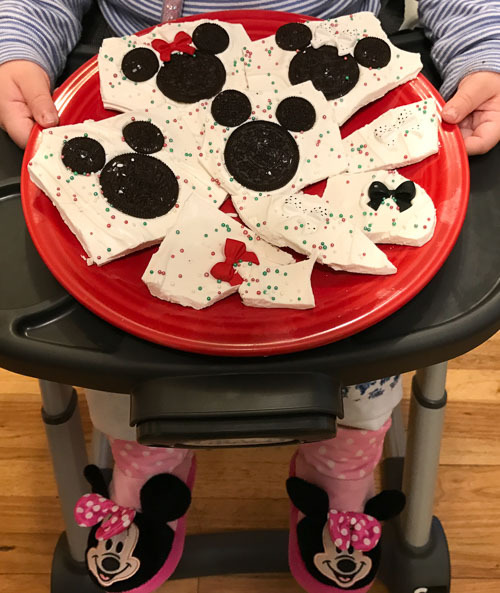 I planned on wearing my toddler, who is about 35 pounds and 37 inches tall, while grocery shopping, going to amusement parks (when she needs a rest), taking walks around the neighborhood, and while doing chores around the house when she needs to be cuddled and I still have stuff to get done. 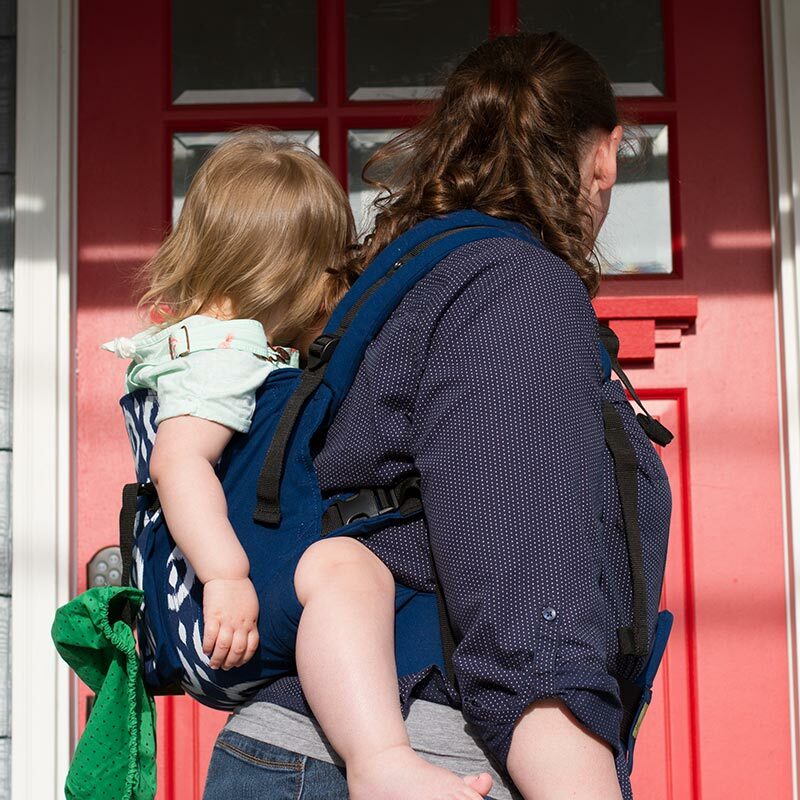 It was important for me to find a carrier that allowed me to carry her in the front, the side, and on my back, since I wanted to have the option to have my hands and front free in case I needed to pick up my little guy. I also wanted something that had well-padded shoulders, some type of lumbar support, and was roomy enough for her to be comfortable. The carrier needed to be made out of durable material that was breathable and easy to clean. I know, I know, it’s a huge wish list! Below is a break-down of each carrier along with pictures. The Tula Toddler Carrier has quite the following. Their variety in patterns allows you to select one that suits your mommy personality, taking baby gear to a whole new level of style. I purchased the Bandit pattern, which I absolutely loved and thought both kiddos would approve being carried in it. 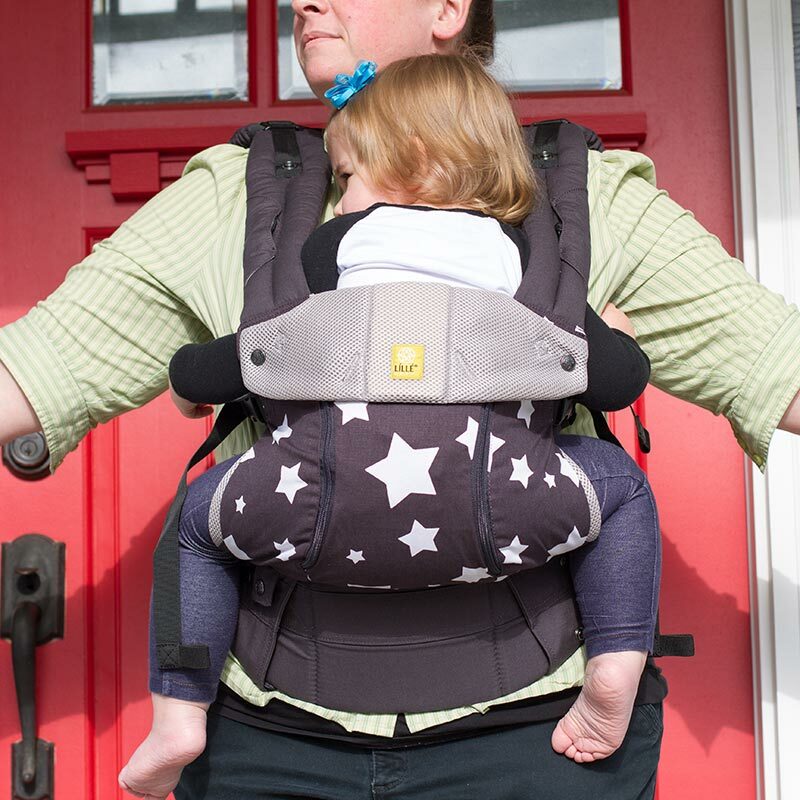 This specific carrier is a toddler-only carrier and is not meant for babies under 25 pounds. 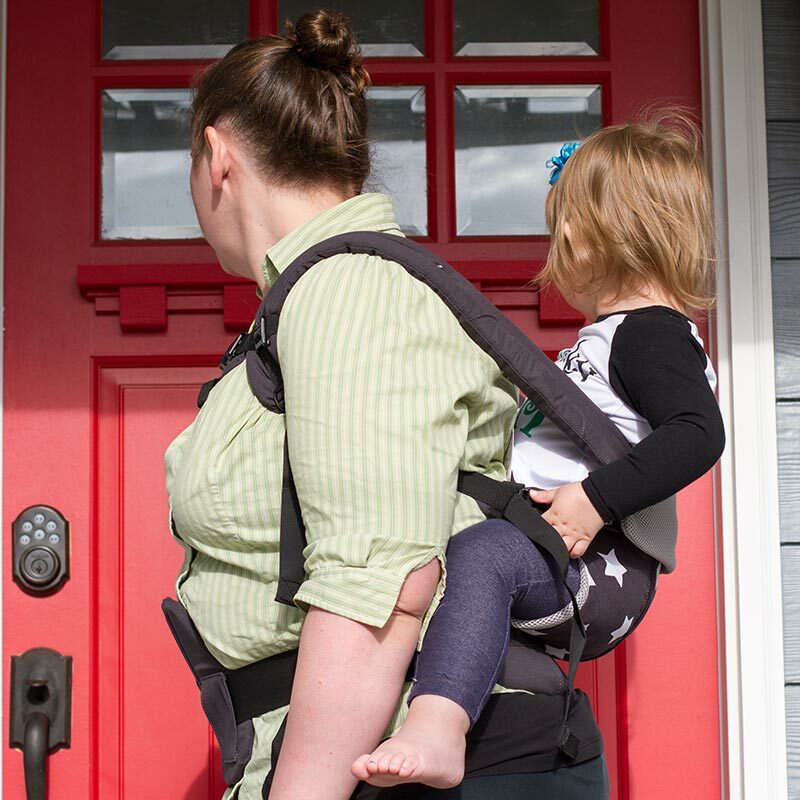 The Tula carrier can be used on toddlers weighing between 25 – 50 pounds (approximately 18 months through 4+ years old) and must be at least 32 inches tall. It allows for an ergonomic m-position seat which supports optimal development for the child’s body and is made out of a nice breathable material that is machine washable. There is a large pocket on the hip belt that holds keys or a phone. It also has a removable hood that provides protection from the weather and can support the child’s head while sleeping. I have also been told it allows for comfortable breastfeeding, but I don’t know from personal experience. All in all, the Tula is a very nice, light weight toddler carrier. I liked that it was machine washable and needed no special care to clean. The material is not as easy to wipe clean on the spot as the other two carriers are, but you can’t beat the style and infinite patterns you get to select from. The straps were standard straps that were sturdy and they provided nice secure support for carrying. I felt that the entire time I had my daughter in the carrier she was secure and comfortable. 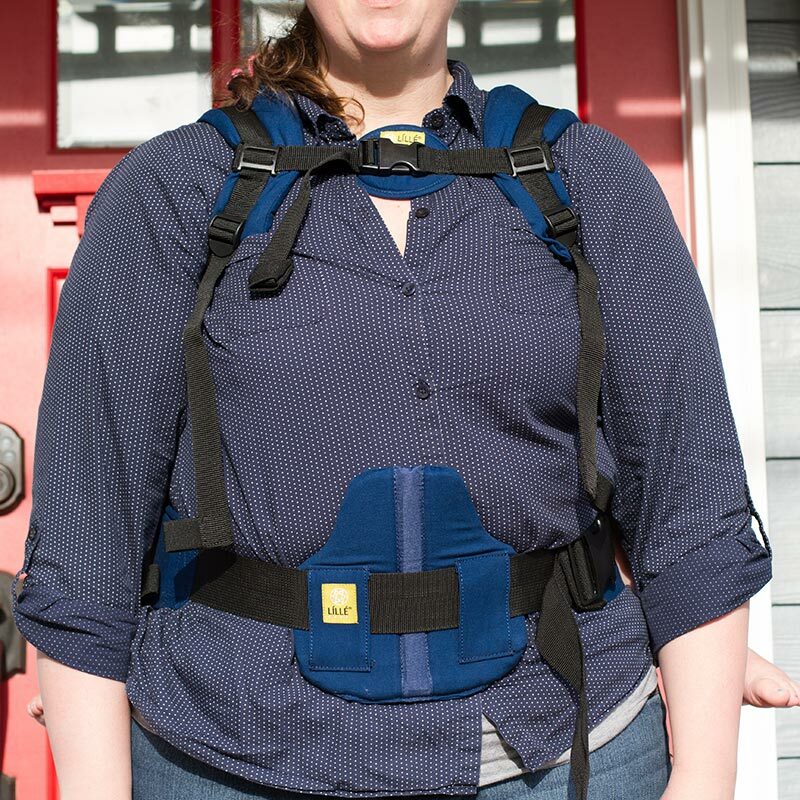 The shoulder straps are padded, but not nearly as padded as the other two carriers. The Tula material was on the thinner side and not quite as roomy as the LilleBaby CarryOn. 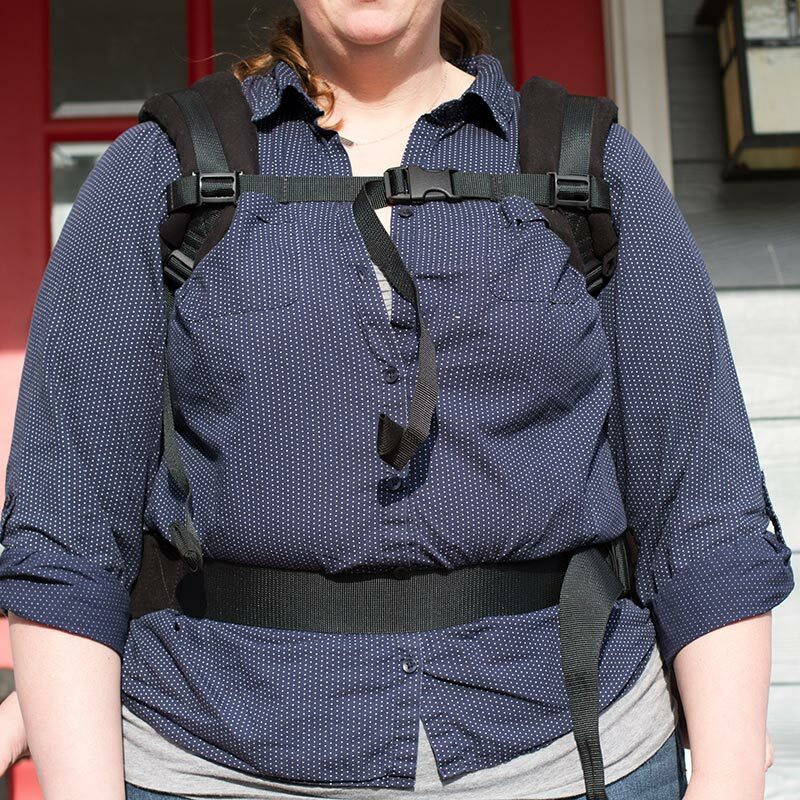 The straps also didn’t have as many adjustable positions as the other two carriers did, which is important if you wear a variety of clothing while carrying (sweatshirts, jackets, t-shirts, tank tops, etc.). Another downside that I found with the Tula is that it only allowed for me to carry in the front and back and I really wanted the option to carry on the side as well. I figured if I was going to invest the money in a toddler carrier, I wanted as many options for carrying as possible. Since I was going to be packing the two littles around by myself, I also wanted to make sure I could get the carrier on and my kiddo in it (BY MYSELF) in all of its carrying positions. I was able to do this without issue in the Tula. One of the biggest downfalls of the Tula was not having lumbar support. When carrying for a longer period of time (hour +), I started to feel the weight of the child in my lower back in the front carrying position. This is where the other two carriers take the lead, leaving the Tula behind in their dust. The lumbar support makes a huge difference distributing the child’s weight, which is very helpful on longer carries. This is probably not such a big deal if you are only looking for a carrier for short carrying times (15-30 minutes), but anything longer and I would say the lumbar support makes quite the difference. Since I have my carrier with me at all times (either in the car or in the bottom of the stroller), I wanted something that would fold up and not take up a lot of room and this is where the Tula really outdid the other two carriers, folding up much smaller than the other two. However, do realize these types of carriers are a little harder to squish into a diaper bag since they’re larger to accommodate toddlers, though if you have a huge diaper bag you might be able to fit it. 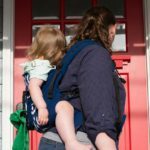 http://www.tulababycarriers.com provides instructions on how to care for your carrier as well as instructions on how to put on the carrier in both carrying positions. If you chose to buy from them, you should also check out their return policy and customer service reviews. I purchased mine from amazon.com because they had it on Prime and I couldn’t wait to receive it. Plus, Amazon has an amazing return policy if you have any issues. 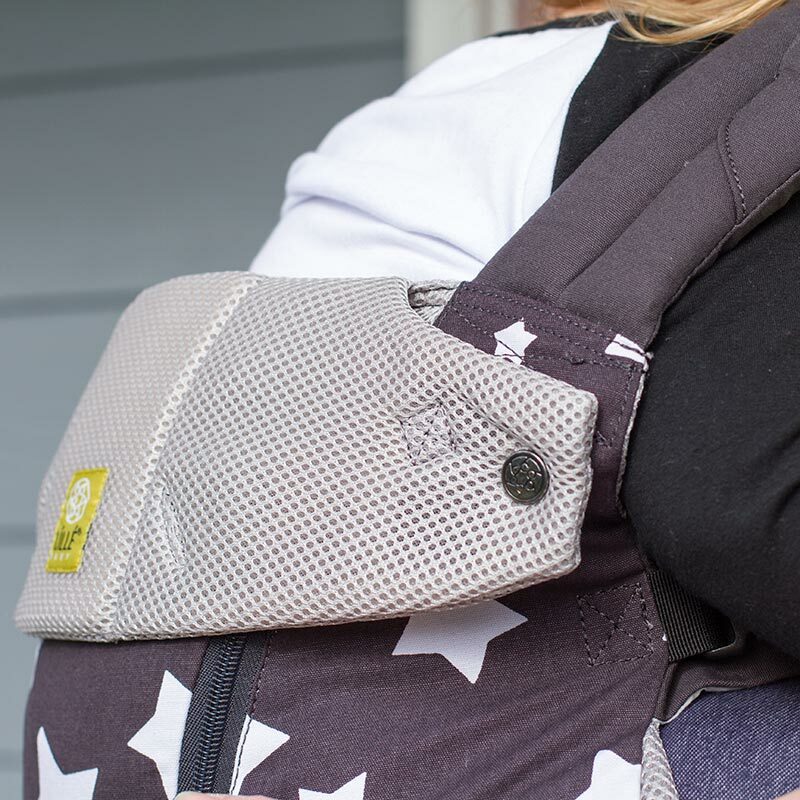 The LilleBaby Complete is a six position ergonomic baby – toddler carrier made with a mesh insert for temperature control, thus making carrying in all seasons delightful. It is made of 100% cotton that is durable and soft to the touch and is of course machine washable. The Complete features lumbar support, neck support (newborn carrying), a hood that is easy to use, two-way adjustable shoulder straps, and a decent sized pocket that zips. What makes this carrier special is that it can carry from newborn (7 pounds) all the way up to 45 pounds, with no additional products to be purchased or added in, making it versatile. 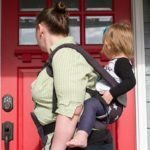 I would classify it as a hybrid carrier meant for someone who is looking to buy just one carrier and have it until their child no longer needs to be carried or reaches 45 pounds. The straps are 3 inches wide and very sturdy. 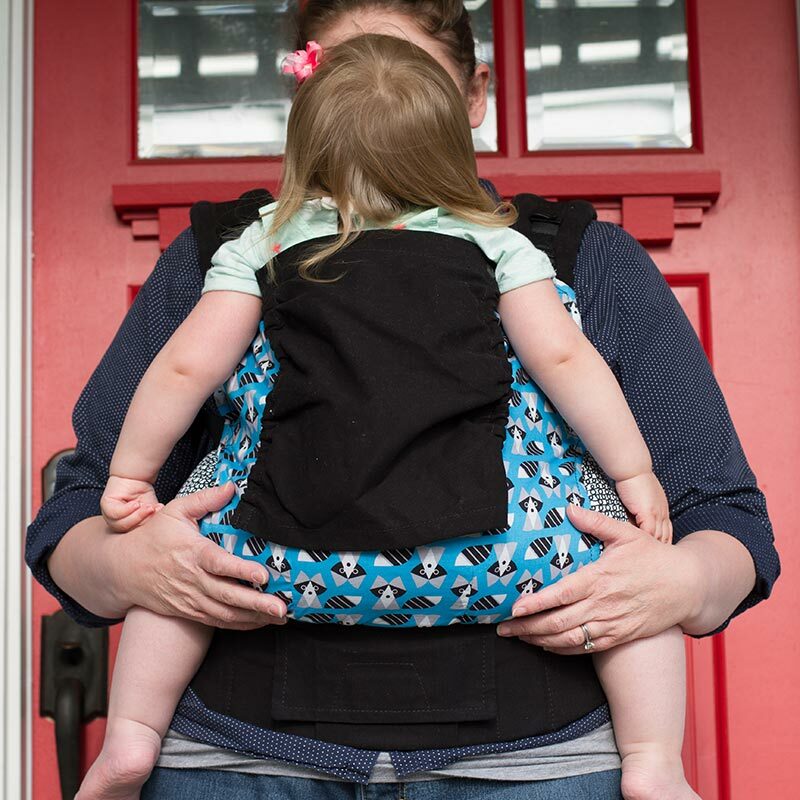 This is a wonderful carrier… sturdy and comfortable with lots of flexibility for a parent that does not have another carrier and wants to purchase one that will last from birth to toddler. 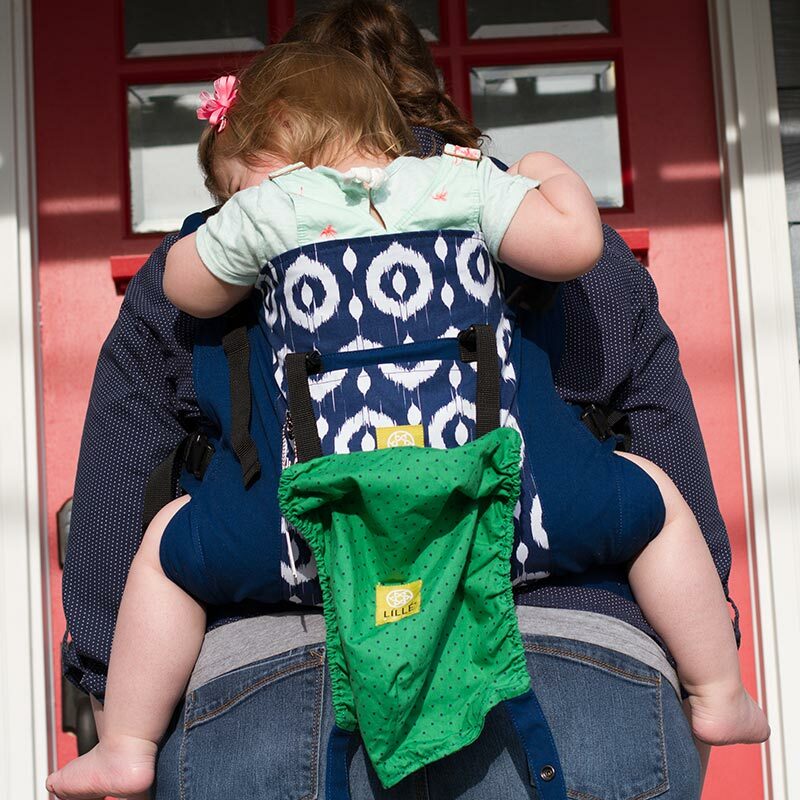 The LilleBaby Complete felt like a jack of all trades carrier. 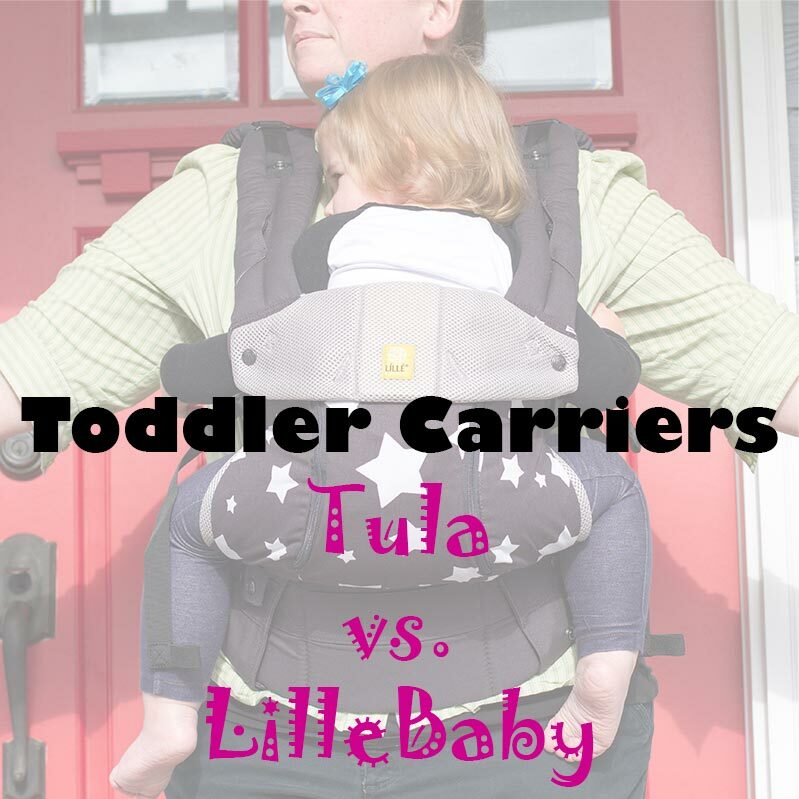 It was an over-the-top carrier for an infant, yet fell short in the toddler carrier category when compared to the Tula and LilleBaby CarryOn. I did consider this carrier to utilize as my only carrier, but the lower weight limit was a huge negative. You also have to do a lot of adjusting to switch from newborn/baby carry to toddler carry positions and the toddler carry position did not appear to be as roomy as the LilleBaby CarryOn and Tula. Unfortunately for this carrier, once I had experienced the toddler-only carriers, this hybrid was out of the running! 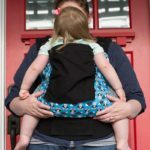 Please keep in mind, it is still a very nice carrier and definitely worth looking at if you’re in the market for a newborn/baby carrier with a higher weight limit. The LilleBaby CarryOn is a toddler only carrier. I decided to go with navy with ikat rings and it is worth noting that there are not as many colors or patterns to choose from in comparison to the Tula. This carrier can be used on toddlers weighing between 20 – 60 pounds (approximately 12 months +). 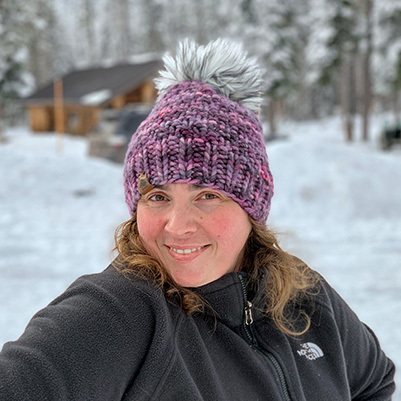 The material is 100% durable cotton that is soft to the touch and machine washable and allows for ergonomic front, side, and back carry, which is a huge plus in my current situation. It also has lumbar support with three-way adjustable straps. Two larger pockets and a removable hood are also included. This carrier is absolutely amazing! It is the Cadillac of carriers. The material is light, durable and easy to clean and the torso portion is much roomier than the other two for my little one. She can easily put her hands inside or outside of the carrier or relax back with no lack of room or support. The pockets are big, but I don’t use them because I generally forget that I put something in it and it either falls out on the ground when taking the carrier off or I lose it until the next time I put the carrier on and find it. The three-way 3 inch adjustable straps are so nice, especially when wearing different types of clothes (example: sweatshirt vs. tank top) and the straps are super padded…like a pillow on your shoulders. 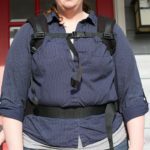 The icing on the cake is the lumbar support…I seriously cannot believe what a major difference it makes when doing the front carry! It helps disburse the weight of the child, which makes quite the difference on your back after carrying. The CarryOn goes on just like the Tula in the front and back carry positions, but the CarryOn allows for a hip carry position as well. Easy to put on and take off and folds up nicely to be packed. Tula definitely gets a point here, since it folds up the smallest between the three carriers. 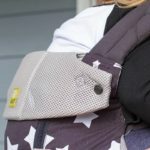 http://lillebaby.com provides instructions on how to care for your carrier as well as instructions on how to put on the carrier in each carrying position. If you chose to buy from them, you should also check out their return policy and customer service reviews. I purchased mine from amazon.com because they had it on prime and I couldn’t wait to receive it. Plus, Amazon has always been great to work with if there was an issue with my order. Do you even have to ask? I would recommend the LilleBaby CarryOn to anyone looking for a toddler only carrier. It exceeded my expectations and I truly enjoy wearing my kiddo in it. Now, I will also admit that I loved the other two carriers as well, but the LilleBaby Complete seems to fall short as a toddler only carrier (which is what I am looking for) and the Tula (though super stylish) just didn’t provide as much support as the LilleBaby CarryOn. Again, everyone wears their carriers differently and are looking for different qualities in the carrier they select. Don’t get me wrong, all three carriers are great and I wouldn’t turn down any of them as a gift, but as far as selecting one to buy, LilleBaby CarryOn wins hands-down! Definitely do your research and know what your goals for the carrier are. Please feel free to leave a comment or email me any questions you might have. Best of luck!